Production of our Ray Mears Bushcraft Knife, as made by the esteemed British knife-maker Stephen Wade Cox, will soon be coming to an end in its current form. Our limited supply of Iroko – the African hardwood salvaged from a demolished church to create our handles – has slowly but surely diminished with each batch of knives. Following on from this, the very last batch of Iroko-handled knives will be made available this September. 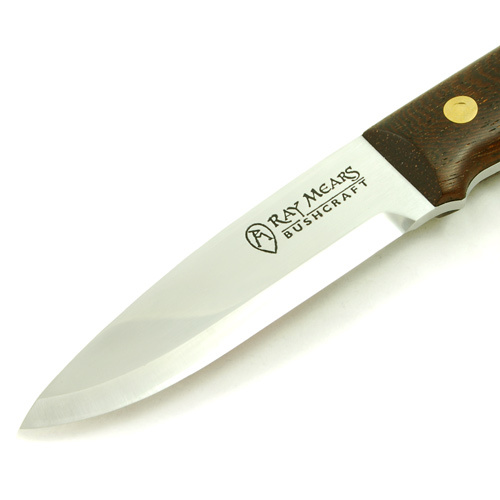 However, this departure does not mark the end of our collaborations with Stephen Wade Cox; a new version of the Ray Mears Bushcraft Knife is currently in the works, and further news of this model will be released later this year. This entry was posted in Bushcraft Clothing & Equipment, Site Announcements on July 27, 2011 by Woodlore Team. With our Iroko supply coming to an end, the plan is to produce the Ray Mears Bushcraft Knife with a handle made from an alternative material. We’ll be giving some clues on the chosen material nearer the time on Woodlore’s Twitter feed. As for the source of our Iroko wood, it was salvaged from a church in the West Midlands. Beautiful Wood, Great that it’s recycled!